HONEYSUCKLE LN - Country Home on Acreage in TN, Shops, Row Crop, Creek – Nice 3 Bedroom Country Home for sale on 117 Acres+/- with 2 Full Baths, Income Producing Cropland, 60x30 Metal Shop w/Electric & Water, 40x30 Metal Shop w/Electric & Water, Creek, Good Deer Hunting, Turkey Hunting, Great Garden Spot & Small Orchard with 2 Big Muscadine Vines, Over 60 Acres of Timberland, Newer 5 Ton Central Heating & Air Unit, City Water, Natural Gas, Propane, Home all One Level, Beautiful Open Great Room with High Vaulted Ceilings, Custom Cabinetry, 2 Natural Gas Fireplaces, Sun Room, Double Garage, and a Very Private Country Setting located on a Dead End Lane with just about all the privacy that you can hope for. This is a Really Special Property. This place has been well taken care of and will make someone a Great Homestead and/or Farm as it did for the current owner. The Gorgeous Tennessee River is only a Short 8 Mile Drive Away and Features Great Fishing and Boating anytime of the Year. To me it is one of The Most Perfect Properties because of the Balance of Open Land, Wooded Land, Privacy, Live Water, Hunting Ability, and in other Words, it Has a Little Bit of Everything You are Looking For. Give me a Call at 731-925-7900 or E-mail, Tony Alcott, II . E-mail address is tonyalcott@unitedcountry.com . Lovely Country Home has Lots to offer with approximately 2,674+/- Sq.Ft. all on One Level with 3 Bedrooms, 2 Full Baths, Hardwood Floors, a Separate Office with Built in Desk and Shelving, a Big 42x11 Sun Room with Natural Gas Fireplace & Custom Shades on Windows, and a Very Nice, Large Great Room with a Natural Gas Fireplace, High Vaulted Ceilings, Custom Kitchen Cabinetry, Island with Breakfast Bar, and a Breakfast Nook. The Master Suite has a Sizable 16x14.5 Bedroom, Double Walk-In Closets, and a Private Bathroom. There are 2 Guest Bedrooms, Both with Hardwood Floors, One with Double Closets and a Padded Bay Window and the other with Glass French Door Entrance. The Guest Bathroom is Pleasant and has a Linen Closet. There is a Foyer Hall, Coat Closet, Nice Laundry Room, Double Garage, Pull Down Attic Stairs with Floored Attic Storage that could be finished out if you ever needed more space. The Home has a Newer 5 Ton Central Heating and Air Unit, City Water, Natural Gas, Propane, Quaint Front Porch, Concrete Driveway Section, and Vinyl Siding. This Home is Nice and seems to be Very Well Kept. You Will Love Calling this Home!! Outbuildings – There are 2 Nice Metal Workshops. One of the Shops was built in 2016 and is 60x30 with Electricity, City Water to the Shop, Concrete Floors, and 5 Roll Up Garage Doors Built by Reed’s Metal. The other shop was built in 2004 and is 40x30 with Electricity, City Water to the Shop, Concrete Floors, and 2 Roll Up Garage Doors. Both Shops are located close to the home and have a good driveway to each shop. Land – This Land is nearly a Perfect Mix of Open Land and Wooded Land. To me, this makes this place worth a lot! 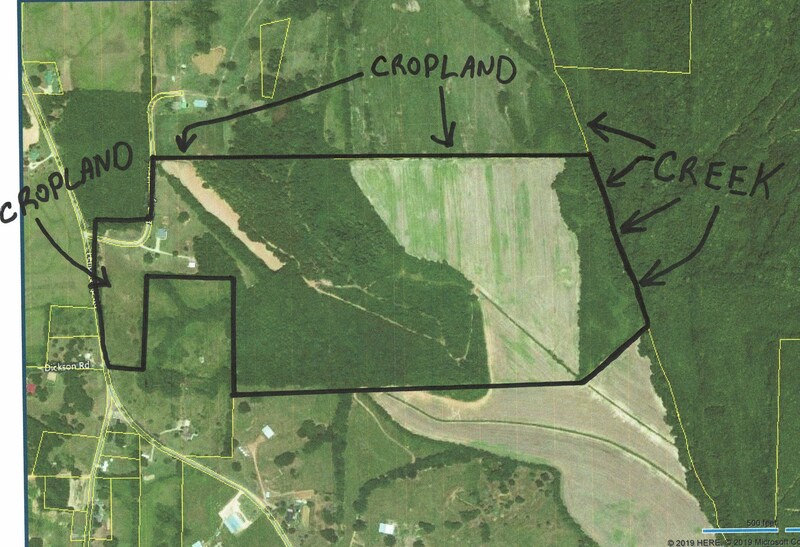 The land is a Total of 117 Acres+/- according to courthouse records with approximately 44 Acres in Income Producing Row Crop, approximately 5 more Acres Open that is not in Row Crop, and Approximately 65 Acres Wooded. There is a Large Year Round Creek along the back line with about 1,200 feet of Creek Frontage. This land is Perfect Hunting Grounds for Whitetail Deer Hunting, Turkey Hunting, and Predator Hunting like Coyote and Bobcat. There is Very Large Blind Overlooking the Row Crop that I’m sure the seller would be glad to leave if you buy the property!! The Row Crop Fields could easily be converted to Pasture if needed and fenced to make a Great Cattle Farm or it could be set up for a Nice Horse Farm or Equestrian Estate. There are many options with the Balance that it has. Also, it has a Great Garden Spot & Small Orchard near the home with 2 Big Muscadine Vines.